Gabey Mayow Kalmoy, 33 years old, is a resident of Busle village, a small community of 2000 people in the the Gedo region of the Jubaland State in Somalia. She is married and a proud mother of 5 children. 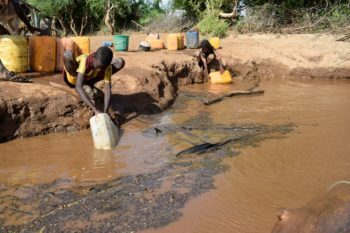 She gives an account of how her life has changed tremendously since the implementation of the Busle Water Project through ACT member Norwegian Church Aid’s (NCA) Drought Response and Recovery Program. “You don’t know the value of water until your only source is dirty water from the river.” Gabey recounts how she and her children used to walk for long distances just to fetch water, which was not safe for human consumption , but she had no other choice but to use the same water for her family and the livestock. Water safety was not the only concern she had. Fetching water was also extremely dangerous, especially for women and girls. “We used to walk for almost 3km to fetch water. Some of us were pregnant while some carried babies on their back. Children were also sick on a daily basis with acute watery diarrhea. Life was really hard,” said Gabey. 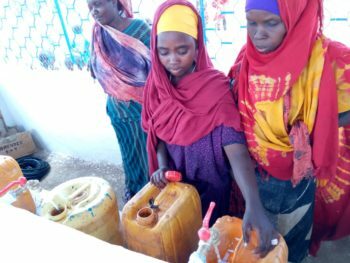 According to her, the life of her family changed immensely after the water kiosk was built in May,2018. Gabey is very grateful to those who made this possible. NCA and its implementing partner, NAPAD have helped her and the community with something extremely valuable. Although they still need to buy water, it comes at the very cheap price of $3 per month for a single household. Gabey says the system is sustainable and now she is able to focus on other priorities. She urged NAPAD and NCA to continue implementing similar projects to ensure that other villages have access to sufficient, good quality and sustainable water. Through the ACT Appeal SOM171 Drought Response, NCA and NAPAD were also able to build a solar powered water pumping system, a twin latrine at the village primary school, build a connection of piped water to the Busle health center. The also trained 30 school children health club members, 20 hygiene promoters, and organized hygiene demonstrations and awareness campaigns for two villages.